Custom Jewelry — South Hills Jewelers | Since 1982. When You Want Jewelry That Makes a Statement. Do you want a piece that is as original as you? We turn your dream jewelry into reality, designing customized pieces right here in our store. And really, what more could you want out of a piece of jewelry than something that was handcrafted specifically for you? Customized jewelry comes in all forms, from endless origins, and into some of the most beautiful jewelry we see. We work with you, our customer, to create a brand new custom piece, or to fashion a redesign, giving older jewelry a whole new look. Not only do we love the creativity involved in turning something old into something new, it’s a process we are quite accustomed to. 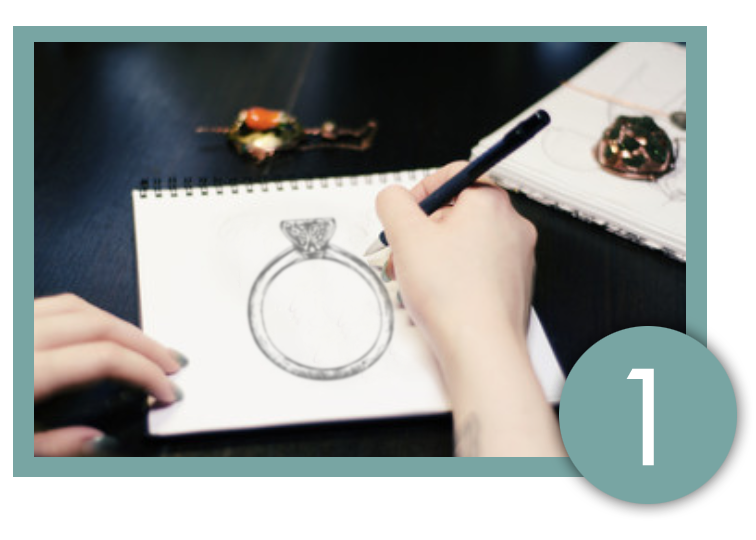 It all starts with a consultation where you’ll work with one of our talented jewelers to ideate and sketch out a draft of your ideal piece of jewelry. We will then use that sketch to make a CAD design, which will give you a realistic, 3D image of what your custom piece will look like. We will go over this and make adjustments until it’s perfectly to your liking. Once we’ve drafted up nothing short of your ideal piece, we’ll cast a wax mold, giving you the ability to actually hold, feel, and see the custom designed piece’s size and shape before it is cast with your chosen material and the stones are set. The process is simple—we make sure of it. We know that coming up with your own creation can feel overwhelming, but the happiest stories we hear from our customers are about the custom jewelry they’ve created with us. That’s because custom jewelry is more than a way to be unique, it’s a way to show your partner you care about the details, it’s a way to carry on tradition in your own style, it’s a way to create a long lasting piece of wearable art. So what do you say? Let’s get started! Ready to Get Started on Your Custom Design? Use the form below or call 412.833.1588 to start your custom creation today! Give us an idea of what you are looking for, and one of our team members will get in touch with you within 1-3 business days!